There’s a certain level of structural expectation that comes along with the style of progressive rock; divergence from which tends to be uncommon. Complicated, multilayered, often high tempo parts – all packed into tracks that average anywhere from five to seven minutes – make the genre both very easy to stick with but also very difficult to approach, depending on whether the listener at hand takes to these kinds of qualities. Why such a blunt decision one way or the other? The answer is consistency. Unlike its pop rock counterparts, prog rock tends to uphold a relatively understood sound ever before hearing a single note of a new or established band. That might make the genre seem overrun by its own stereotyping but when established associations ring true, carrying them as a barometer for emerging artists isn’t entirely unexpected. Then a band like Pocket Healer comes along and decides not to stand on one side or the other of its chosen style. Dense seven minute compositions with three solos, two interludes, and a bridge that changes time signatures two and a half times, can be overwhelming. 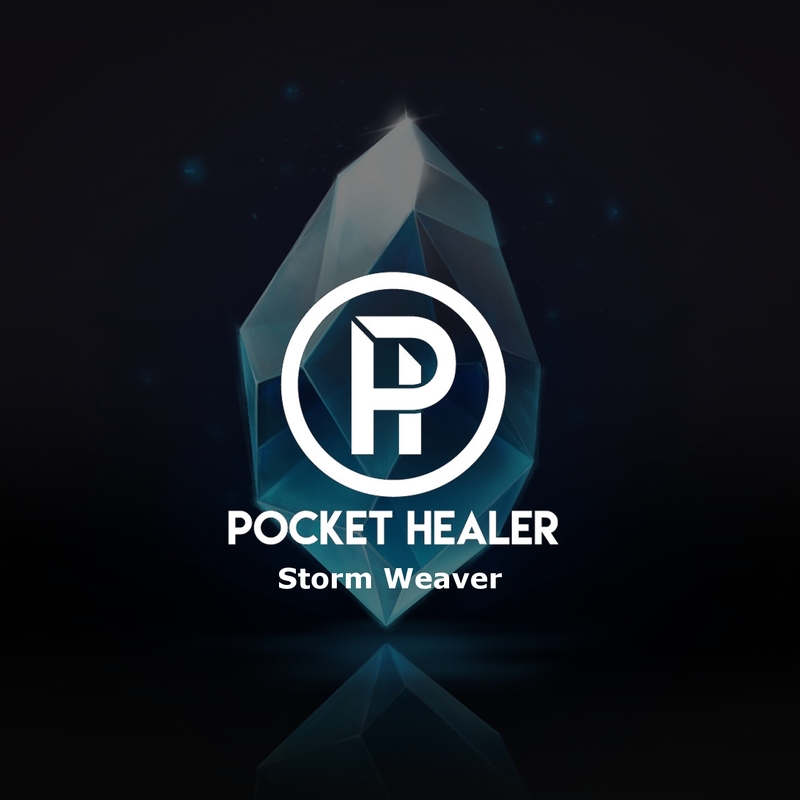 Lucky for the progressive rock fan on-the-go, Pocket Healer’s debut single, “Storm Weaver,” is about to fill in a gap listeners didn’t know they could love. Imagine a song that provides the bottom heavy arrangements of bands like Royal Blood and Queens of the Stone Age, with the poised dynamic changes, clean, almost synth-rock leaning production of a prog rock staple like Dream Theater, and the succinct compositions of power duos like Death From Above. Clocking in at a mere two minutes and 31 seconds, “Storm Weaver” takes up the space of an average, garage punk track. However, in that same span of time, the song delivers enough instrumental texture, and compositional variation – not to mention an overall balanced flow – to leave the few minutes of music feeling much longer and leading to a sense of satisfaction over rushed anxiousness. The latter would be much more likely if the duo had opted to use lots of bells and whistles (whether in performance or in arrangement) just for the sake it, subsequently making a rather overwrought statement for the band’s debut. Patterson’s bass, which both ignites the song’s fuse after a subtle and anticipatory introduction, and pulls the track along with a loud slap tone, moves smoothly between melodically charged duties and those of rhythmic co-pilot. The more jazz leaning choice of tonality leaves the character of Pocket Healer’s first impression the ability to carefully adjust and change between the extremes of super sanitized electronically steered riffs or an overly distorted, jagged, and fuzzy tone. There’s reason to believe future songs by Pocket Healer could stay relatively within this degree of definition or, be just as unsurprised if the gracefully dancing elements of the band’s next song have a little less pristine separation in the mix. Patternson and Ferrara come through solidly in sync, as varying parts of Ferrara’s drum kit alternate in playing rhythms that correspond with Patterson’s notes – whether they are intended for melodic purposes at the moment or not. Primarily drive by a ten note, two part, syncopated hook, despite the tendency for default push and pull when dealing with emphasis between notes on and off the beat, Pocket Healer is able to create a sense of even keeled movement forward, because of the unison between the bass and Ferrara’s snare and cymbal on every other note. The result is a harder and more pronounced sound for those beats but the ebb and flow of intensity remain consistent. Thus, “Storm Weaver” plays through like a level road journey, despite an obvious game of rhythmic tug-of-war. Further aligning the quick hit ability of Ferrara’s kick drum with the bursts of faster ascending notes played by Patternson shows how the pair can really back each other up, without taking away from Pocket Healer’s objective of building a layered, intricately structured song. Pocket Healer’s craftiness lies in the blending of the duo playing independent parts while also matching one another, thanks to the miracles of many drums. It’s from this that the illusion of extra complexity without chaos, comes. When observing the “Storm Weaver” as a whole, the track plays to its short length strength – providing a slight respite from Pocket Weaver’s own sonic saturation in the process – by placing a dynamically quieter, and more instrumentally subdued interlude about half way through the track. It’s here that some sprinklings of synthesizer beeps, as well as wispy, almost wind-like laser tones, give Pocket Healer a different way to showcase neat precision beyond just straightforward pace and-or amount of notes – something that often shapes the individual character of progressive bands. Kudos to Frank Mitaritonna (The Dear Hunter, Glassjaw) of VuDu studios, who adds his restrained but recognizable engineering touch behind the mixing board and in mastering for the track. There’s a relatively easy-to-follow roadmap here in “Storm Weaver” but that doesn’t make this debut single a skim-worthy affair. Plenty of interesting bits and pieces of notes, instrumental quirks, and overlapping harmonies reside in the nooks and crannies of the song, which are liable to be heard with a (few) good dedicated listen(s). All the same, there’s no pressure to block off an entire lunch break just to hear the track. It’s progressive rock in the express lane and that makes it a perfect introduction for new fans to the genre. Keep an eye out for the remainder of Pocket Healer’s planned three track EP introduction, in the form of gradual releases over the rest of March! “Storm Weaver” is available now through Bandcamp. Find it streaming on SoundCloud.